For me this implies that mobile commerce is a trend, a passing fad that will soon be forgotten, or superceded by something else. Is mobile commerce different to ecommerce? Mobile commerce is a natural progression of ecommerce. On some levels they are nearly identical, but there are also important differences between the two. As a result, you will see me use ecommerce instead of mobile commerce a few times throughout this article, and you are welcome to do the same. But I will only interchange them when referring to the aspects that overlap; there will be times when only mobile commerce will do. Why does mobile commerce matter? Mobile ecommerce sales account for 34.5% of total ecommerce sales in 2017, and that number is growing. By 2021, mobile ecommerce sales are expected to account for 54% of total ecommerce sales. By now your website – and online store – should already be accessible on mobile devices, but that doesn’t automatically mean your business is ready for mobile commerce. And as eMarketers numbers suggest, you could be missing out on a lot of sales. Per DynamicYield, “Only 12% of consumers find shopping on the mobile web convenient“. That’s a lot of room for improvement. More importantly, our use of mobile is influencing our buying decisions even when we are in a physical brick-and-mortar store. One-third of our decision to purchase is influenced by looking up additional information on a product via our mobile device. But before we get ahead of ourselves, let’s start from the beginning. Mobile commerce, also called m-commerce or mcommerce, includes any monetary transaction completed using a mobile device. It is an advancement of ecommerce, enabling people to buy and sell goods or services from almost anywhere, simply using a mobile phone or tablet device. But mobile commerce is more than just a simple evolution of ecommerce. Electronic tickets and boarding passes. Digital content purchases and delivery. Contactless payments and in-app payments. Mobile marketing, coupons, and loyalty cards. Are there different types of mobile commerce? Mostly similar to ecommerce, but accessible via a mobile device. Mobile shopping is now possible through mobile optimized websites, dedicated apps, and even social media platforms. Not too different to online banking, though you may find some transaction types are limited or restricted on mobile devices. Mobile banking usually involves a dedicated app, though some banks have started experimenting with the use of chatbots and messaging apps. There are so many diverse mobile payment options that we have chosen to cover them in detail further in this article. As a business owner, and user of BigCommerce, your exposure and interest in mobile commerce would mostly relate to shopping and payments, which is what the rest of this article will focus on. There are disadvantages to many forms of doing business, but this should never be viewed as a significant hindrance. The advantages usually outnumber the disadvantages, and there are ways to overcome many of the pitfalls, especially when you know what some of them are. Let’s start with the good, first. 1. Better overall experience for customers. Ecommerce already made shopping more convenient. A wider variety of products. All without ever having to step away from their computer. With mobile commerce, they still have these benefits, but now they don’t even need a desktop computer. As long as they have a mobile device, they can shop whenever they want, wherever they are. Chatbots and messenger apps which making it easier for businesses to interact with their customers using apps and services their customers already use and love. 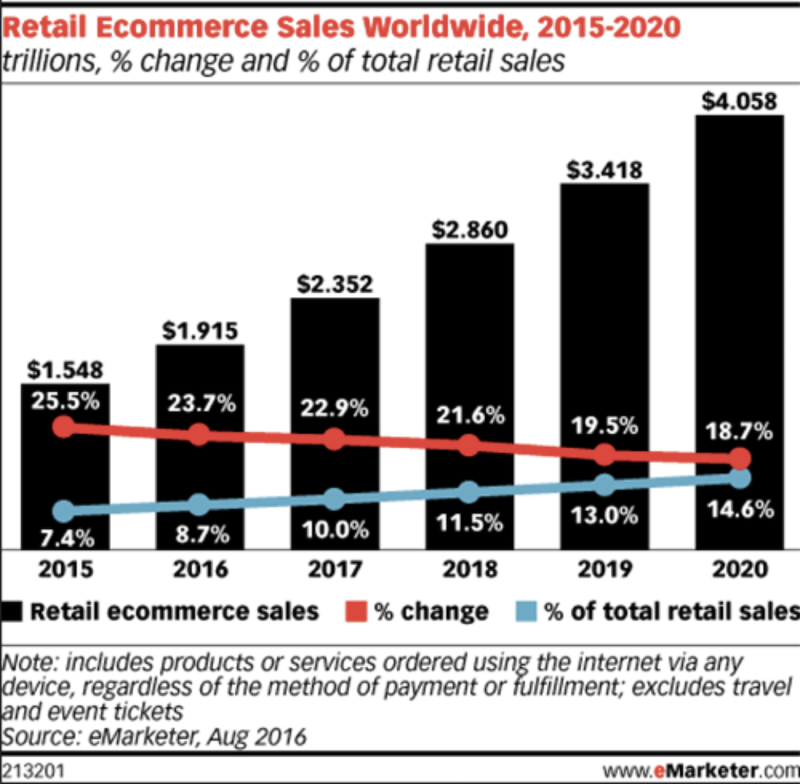 eMarketer expects global ecommerce sales to reach $4.058 trillion by 2020, representing 15% of total retail sales. And the percentage of that belonging to m-commerce will also continue to grow, as more online retailers see more than 50% of traffic coming from mobile devices. This suggests that retailers investing more in mobile commerce can ultimately expect a higher conversion rate and ROI. 3. A true omni-channel experience. An omni-channel experience is when stores sell both online and offline — likely also selling through multiple online channels (i.e. on Amazon, eBay, Facebook, B2B). We’ve also been referencing the importance of listing your product wherever consumers are already spending their time. This is increasingly known as contextual commerce, a more strategic take on the overarching omni-channel term. Omni-channel is about being where your customers are, and making it possible for them to buy what they want. And mobile commerce makes this easier than any other form of multi-channel marketing and selling. BigCommerce’s Amazon integration is really good – and it’s really helped us out. We’re converting more ecommerce and online sales due to our Amazon presence now. I would have never gone out to put products on Amazon on my own. The fact that it was going to be easy to integrate directly through BigCommerce if why I did it – and now, we see 1 out of every 10 orders coming to us through Amazon. It’s a great gateway to gaining customers, especially when you are strategic about which products you put up there, and which you make exclusive for your own site. I think beyond just selling on Amazon for Amazon’s sake. Being there helps to create more customers for our website, too. It helps us with volume and with growing our website and our clientele. 4. Variety of payment options. With new mobile payment solutions emerging, it is now possible to offer customers a truly diverse range of payment options. This doesn’t mean we’ve moved beyond “cash or card,” but mobile commerce has given up mobile wallets, which make one-click checkouts possible in more than one store. No more having to manually enter your credit card details and shipping details the first time you shop at a new online store. This isn’t so much of a pitfall as it is a need to change your way of thinking when it comes to developing and managing your online store. As we will discuss later, the speed at which the pages of your website load play a critical role in conversions and repeat business. You will need to be aware of advancements in technology, and changes in optimization best practices to ensure your website – at least on mobile – offers a superior experience that is fast and simple to use. 2. Variety of payment options. The diversity of payment options is both a benefit and pitfall when it comes to mobile commerce. Many mobile wallets are not available in all geographical locations, while consumers in some locations prefer one payment option over another. In Holland, for instance, 70-80% of people use iDeal, which is a payment system not really used anywhere else. If you don’t have iDeal in Holland, the Dutch won’t buy from you. All countries have their nuances like that, which is why it was so important we used Adyen with BigCommerce. Adyen supports a large volume of sales, and allows customers to choose their preferred payment method without cluttering up the checkout flow with a bunch of different payment options. You can even use IP addresses to automatically fill in a country’s preferred payment as someone checks out, so you don’t disrupt the checkout flow for the end user. And offering more choices for payment isn’t always a good thing. A regularly cited study from 2000 found that a higher number of choices often leads to a decrease in sales and customer satisfaction. It will be difficult to get the right mix of payment options when your online store first launches, but in time you will gather reams of data about your customers that will allow you to adjust them to what your customers use and want. One-click solutions will always be preferable because they make checkout less cumbersome, but don’t ignore some payment options because they only work in certain locations. 3. Easier for customers to compare prices. The traditional way to do a bit of comparative shopping was to know your prices in advance, by scanning a number of catalogues and advertisements before you went to any physical stores. Alternatively you could have moved from one shop to another, and get a great workout in the process. But mobile commerce has – again- simplified this. Armed with little more than a mobile phone, customers are able to rapidly compare the prices – and shipping costs – for dozens of stores until they find the one offering the most value. And most of the time this happens without you even knowing it. You can overcome this by – like your customers – constantly being aware of what your competitors are charging for the same products, not just those close to you, but also those miles away, and even across borders. 4. Need to know and comply with a wider range of regulations. This is a pitfall for both traditional ecommerce and mobile commerce: knowing and complying with a large number of tax laws and other regulations for all the countries you ship to. Some online stores avoid this by only selling and shipping to residents of one country, or only a small handful of countries. But this severely limits the size of your market, which is meant to be a benefit of ecommerce. It is true that some products can only be shipped to a few international markets, but for everything else you should – as your business grows – investigate the feasibility of expanding across borders. A smart alternative is to make some of your products also available via Amazon, so while your own online store only ships to certain locations, through Amazon you are able to ship far more widely. With Amazon taking care of many of the regulations involved. Cross-border commerce happens for online brands regardless of their strategy. The internet is a free for all –– with IP addresses dictating the currency your international consumers see. But what if you are ready to invest in international expansion and localization to own a brand new market long before you competitors? That’s what this guide will teach you to do. Choosing the right payment solution for your ecommerce business is even more important when it comes to mobile. Your customers would prefer skipping the need for adding credit card and shipping details, so one-click solutions that integrate with mobile wallets offer you and your customers more. Simpler checkout and payment leads to more conversions, more sales, and more repeat business. For some brands, like Power Support, choosing the right payment solution can result in an immediate increase in conversions. For Power Support, they say a 26% increase in orders within two weeks after installing Amazon Pay. Mobile payments is one type of mobile commerce that has become an industry all of its own. While not all of these are applicable to ecommerce, it helps to understand what each type of mobile payment means. Mobile wallets make it easy for online shoppers to securely store their credit card details, shipping address, and more. The benefit to shoppers is that when paying for online purchases they don’t need to enter all this information again, which can be especially awkward on mobile phones. At checkout they simply select the mobile wallet they are registered with, and authenticate using Touch ID or a PIN. Nothing more. There are a many mobile wallets available, though some are limited to specific geographical locations, and only a few are accepted by most ecommerce merchants. Here is an example a brand out of the UK, Sour Cherry, using PayPal One-Touch for a one click payment option. Contactless mobile payments make use of select mobile wallets to facilitate payments made in-store. Some banks launching their own mobile wallet too. When making a payment in a physical location, customers can place their phone close to a supported terminal to validate and transmit payment, instead of swiping their debit or credit card. 3. Closed loop mobile payments. Closed loop mobile payments are exactly the same as mobile wallets, but are linked to a single brand via a dedicated mobile app. All allow users to add their card details to the mobile app, and to then use the app to pay for their purchases in-store. Here’s an example of Atlanta Light Bulbs’ app payment walk-thru. You can see, you only have to insert your information once, and then it’s one-click every other time you buy from them. Money transfers were previously limited to banking apps, but now there are an increasing number of ways to transfer money from one person to another – on a mobile device – without using a banking app. Anything that makes mobile and in-app payments easier is a plus. Venmo, for example, can be use for both single and split payments in so many scenarios. That means that it can only bolster conversions and revenue when offered as an option. Mobile POS is a way for smaller merchants to process card payments without a traditional card reader. bulSquare, PayPal, and other payment solutions also offer mobile card readers that are portable, and only need a mobile phone in order to process any payments. These could either be small card readers that attach to your mobile phone, or contactless card readers which would allow customers to pay for their purchases using certain mobile wallets. Some of these solutions integrate with various ecommerce platforms, so if you have both an online and physical store your sales and inventory are automatically synced. The Square POS inventory sync and catalog import are exactly what I was looking for. Other platforms take up to 24 hours to update inventory, but BigCommerce captures changes instantly. Used less frequently these days, carrier payments were perhaps the original form of mobile payments. Carrier payments were once a popular method for paying for downloadable ringtones, but is now mostly used for making charitable donations. A user sends a message to a specific mobile number, and the value of the transaction is added to their next cellphone bill. Page speed has always been an important consideration for websites, and it is even more important when it comes to mobile commerce. Google has been encouraging developers to optimize for mobile page speed ever since they noticed that more than 50% of search queries were happening on mobile devices. Page speed has long been a ranking factor, but Google has always only considered the speed of desktop versions of websites. Google started using a mobile-first index which launched in July 2018. That means website or storefronts that are mobile optimized will organically get preference in the ranking algorithm. The number one benefit of re-platforming is the responsive site. Now our mobile conversions are increasing rapidly. Mobile conversion rate is up 272% and mobile revenue is up 193% since this time last year. I’m obviously very pleased with our growth and I definitely attribute it to our re-platform and our new mobile sites. Forrester found in 2009 that 40% of consumers won’t wait longer than three seconds for a page to load before leaving a site completely. With online shopping, site loyalty is contingent on page speed for 52% of shoppers. If made to wait, 14% of online shoppers would simply switch to shopping at another site. After a poor site experience, 79% of online shoppers state they are less likely to support a site again. The study reporting these figures is almost 10-years old, but our expectations in terms of mobile page speed are likely even higher now. A more recent study by Google found that the probability of bounce increases exponentially the longer a site takes to load on a mobile device. All BigCommerce customers have Google AMP (Accelerated Mobile Pages) enabled so their sites and product catalogs load faster on a mobile device. AMP allows our merchants to create cached, fast-loading versions of pages on their storefronts. There is also a content component to this. On the web, on a desktop, a big screen monitor, we want to WOW our consumers with high-resolution images and dynamic, compelling content. But we don’t want to sacrifice the speed and experience if that consumer is on a 3G network and on a small mobile screen. Creating mobile responsive websites has been the norm, but many developers and designers are now building for mobile and optimize for the web. 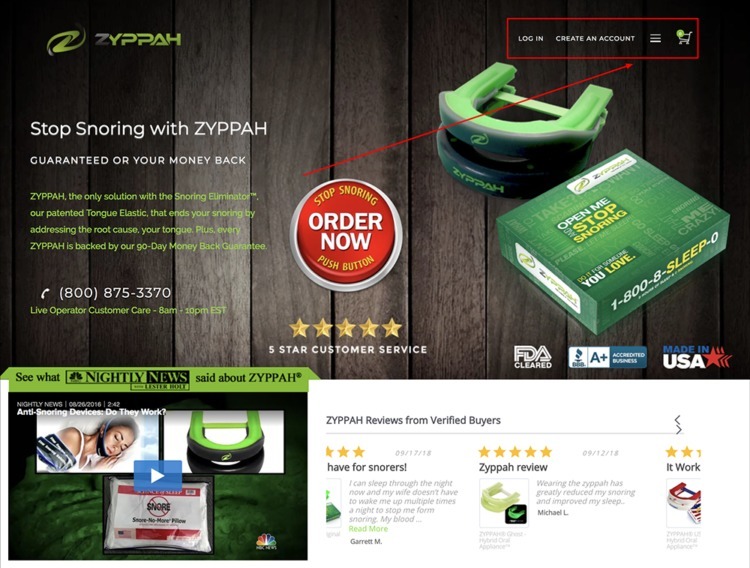 Zyppah.com is a great customer example of a mobile-first design and user experience. They have a hamburger menu, instead of a navigation bar, even on their web version. In 2018, we are expecting mobile commerce sales to grow to $1.804 trillion USD. But it’s not just B2C businesses. Mobile optimization is becoming equally important to B2B and D2C business models. Mobile influences over 40% of revenue for leading B2B organizations. Half of the search queries are made on smartphones. And that number will grow to 70% by 2020. Our B2B customers are validating this trend. Here is a quote from the CEO of one of our 100% B2B customer, Atlanta Light Bulbs, where he simply wanted to put their product catalog on their phone so it’s even easier and quicker for their wholesalers to buy their products. So we should not think of mobile optimization for B2C only because it applies to all business models. There is also an app opportunity, across the globe. In North America, Committed retailers are now driving over 40% of their online transactions through mobile app vs mobile web. Because the metrics are higher when your shoppers are shopping in your app. Their “experience” is controlled by your app environment. The shopper is not looking who else is offering the same product in your store. You know the shopper’s intent because she went through the effort of downloading your app and opening it. Therefore, apps tend to have a higher conversion rate than desktop and mobile web. You can ever further optimize your mobile app experience because you also know a customer is more loyal if they have your app and is likely to make repeat purchases. We have customers, like Pro Stock Hockey, that offer unique incentives and promotions ONLY to their app shoppers. You can also use beacons on a shelf or under a table in the store and when a consumer, with your app installed on their phone, walks by that shelf, it can pop a special promotion or a message on their phone. Similar to how you think of Facebook and eBay as unique channels, an app could be a channel of a set of your consumers that want to have a unique experience. Mobile traffic has already overtaken desktop traffic, and we are seeing mobile sales approach desktop sales. This trend will continue moving forward, with mobile eventually overtaking desktop sales. Retailers with a mobile first mentality will outperform those that treat mobile as a second priority. This mobile first mentality applies to everything: web design, email layouts, reward programs, and more. Most ecommerce platforms have various page speed optimizations built-in, but this doesn’t absolve you from running a few page speed tests, and identifying areas that could do with improvement. It is important to remember that users with a high-end smartphone on a WiFi connection will have a far superior experience than someone with a mid-tier smartphone with a 3G connection. Test My Site – a Google tool for testing mobile page speed. The test is run over a simulated 3G connection, and the results show how long the page takes to load, and how many visitors you can expect to lose with that loading time. You can enter your details to receive a slightly more detailed report via email. PageSpeed Insights – another Google tool, but here you can expect a grading (and improvement suggestions) for both mobile and desktop speed. Here the performance of your website is compared to that of pages monitored by the Chrome User Experience (CrUX) report, and rated as fast, average, or slow. Your page is also assessed to see if it follows any common performance best practices, and you are then given suggestions on how to improve performance. WebPageTest – using this tool you are able to specify what browser, device, and connection type the test should be run on, giving you a better idea of how your website performs for the average user. The results are more detailed, and while you aren’t given any suggestions, you will be able to better identify the root cause of any performance issues. Pingdom – the reports returned after a test using Pingdom are easier to understand than those of WebPageTest, but the free test doesn’t include an option for mobile only. It’s important to remember that all of the tools mentioned here are only ever testing the page speed for a single URL, not your entire site. Depending on how your site has been designed, many suggested optimisations could be applied to your entire website, though you may still want to test several different pages to look for any isolated issues. The following points will discuss how you can implement suggested optimisations to improve the mobile page speed of your site. 2. Optimize & reduce images. Ecommerce sites undoubtedly benefit from the use of high quality images, but modern image optimization makes it possible to reduce the file size of images without affecting the digital quality. But image optimization isn’t just about reducing the file size, it’s also about resizing images for different devices. BigCommerce recently partnered with Akamai to integrate automatic image optimization into BigCommerce stores using the Stencil theming engine. The Akamai Image Manager automatically optimises and resizes images, and also converts them image formats that offer higher levels of compression. Customers in the closed beta for this integration reported as much as 70% improvement in load time across their sites. Unfortunately, ecommerce sites are also at risk of poor mobile page speed as a result of too many images on a single page. Because customers can’t pick up – or try on – products in an ecommerce store, it’s only natural to compensate for this by including multiple images of the same item from different angles. But the old adage of “less is more” still applies here. If you plan your product photos properly, it is possible to get by with two to four images, instead of six or more. In many instances, all you need is a shot of the front, the back, and maybe one or two close-ups that show specific features. Given how much influence images have on page speed, optimizing your images – and even reducing the number of images on each page – will almost always result in a noticeable improvement in load time. In the digital space we’ve been banging the drum on mobile for years now and there are still many sites that don’t get it. Optimize your forms, create mobile first designs, load pages quickly. Mobile is here. Understand how your customers use mobile and optimize. Doing this doesn’t reduce the file size as dramatically as with image optimization, but every millisecond improvement in page speed counts. Google recommends several tools which will minify your code for you, though most ecommerce platforms also minify these files automatically. More built-in functionality means less apps –– and less apps means less code –– and less code means a faster site. But that’s only part of the reason why BigCommerce merchants sell 34% more than those on Shopify. The use of 3rd-party tracking and analytical services is a necessary evil when it comes to ecommerce. But if you’re not using the Google Tag Manager, the snippets of code required by each service can affect page speed. With Tag Manager you are still able to use all your preferred tracking and analytical services, but you only need to add one snippet of code to each page. BigCommerce customers don’t need to manually install snippets on every single one of their site’s pages to get the benefits of Google Analytics data. Instead, one snippet drop on the backend will automatically place the code where it needs to go on your site to make setting up tracking quick and easy. 5. Do a feature audit. Featuritus is a term originally used to describe the unnecessary addition of features to software. And it’s a term that – along with Bright Shiny Object (BSO) syndrome – is also relevant to web sites. Each feature and software integration you add to your site requires additional resources, which impact on page speed. A feature audit means honestly judging the value of each feature and app you’ve integrated into your site. The tests you ran through Pingdom and WebPageTest would show the impact of any scripts, images, and other resources needed for some features and apps. Do you and your customers benefit from all of them? Is the benefit gained more valuable than that of a better page speed on mobile? Would removing any of them negatively affect sales and conversions? If so, is there a way to keep the feature or app, but reduce the impact on page speed? Depending on your site structure, not all of the optimization suggestions made by Google – or discussed here – will be possible. And while those that are typically lead to speed improvements measured in milliseconds, each millisecond adds up. No matter what, faster is better and less is more. Remember also that there is a lot to gain from taking a mobile-first approach to developing and optimizing your website. We’ve achieved 5% conversion rates on mobile with over 80% of our sales on mobile devices. People began talking about mobile apps as the future – and as a must-have for any business – soon after Apple and Google first launched their app stores. And while for some businesses there certainly is value in having a branded app, there is still some doubt over whether every business stands to benefit from having a branded app. U.S. mobile is still largely a browser based world as mobile browser audiences are ~2X larger than app audiences across the top 50 U.S. mobile web properties. As shown, the median browser audience (across the top 50 U.S. mobile apps as of July 2015) has grown at 61% per year, while app audiences have grown at an average of 51% per year. Said another way, mobile browser audiences have grown 1.2x faster than mobile app audiences off of a 1.8x larger base. Note that this over-indexing toward browsers is the opposite of what most investors we speak with expect, who often ask about the”app-lification” of consumer behavior as we transition from desktop to mobile. Nearly 90% of time spent on mobile (across iOS and Android devices) occurs in app. But Flurry’s breakdown of how people are spending their time on mobile matters, as we see that the app time spent data is skewed upward by gaming (32% of time) and social (a total of 29% of time between Facebook at 17%, Other messaging at 10% and Twitter at 2%). This doesn’t suggest SMEs should completely abandon the idea of a branded app. […] enabled us to build our own shopping app. Orders just roll in on the BigCommerce platform. It all talks back and forth wonderfully. A mobile sales app for paperless order writing. Perfect for tradeshows and customer appointments, it works both online and offline and helps you ship orders in hours instead of days. A B2B ecommerce portal that lets customers place orders with you more often. It streamlines your processes, reduces order time and eliminates service calls for pricing and availability. A dedicated mobile commerce app for your B2B buyers to help them save time by buying from their shelves. They can scan barcodes or search for products to quickly build orders. For B2C customers, a Progressive Web App (PWA) could prove to be of more value than simply repackaging your website as a mobile app. PWAs are a fairly new concept that has seen incredible adoption by big brands over the last year. The can be developed and deployed in less time – and at a lower cost – than regular mobile apps. In most instances they only require some modifications to your website code, and the inclusion of a few extra components. They already support key “app-like” features like push notifications, background syncing, offline functionality, and being ‘added’ to the home screen. Other features like geo-fencing, etc. are planned. They are cross-platform, and if setup correctly, will work as a traditional website on any desktop device and Apple mobile device. On Android devices (using the Chrome browser) they look and behave more like a traditional mobile app. They don’t need to be submitted to app stores, which means you don’t need to put in extra effort marketing them, and your customers are not expected to download and install anything. Progressive refers to another key feature: PWAs need to be supported by almost any device and browser, from entry level through to high-end. This usually means either only including features supported by entry level devices, or creating different versions for different devices. With PWAs, all the features you want can be included, but they will only become available to users progressively. A user on a slow connection with an entry-level device will still be able to browse your store, and place an order. But they won’t see certain interactive features, and background syncing and offline functionality might be disabled. Conversions for new users across all browsers grew by 104%, with an 82% increase in their iOS conversion rate. The number of pages visited per session per user across all browsers doubled. Time spent per session across all browsers grew by 74%. One possible explanation for the iOS growth – despite the current lack of support for PWAs on iOS – is that PWAs are usually faster than regular websites and mobile apps, and use considerably less data. Deciding whether to launch a mobile app – or PWA – shouldn’t be driven by claims that everyone else is doing it. It should, instead, be influenced by whether or not it offers benefits and value to your customers, and to you. As a final reminder that businesses can no longer afford to ignore m-commerce, the data team at BigCommerce analyzed figures and trends across the BigCommerce platform in 2017, in order to highlight just how important mobile commerce is right now. Here are the biggest mobile commerce trends in 2019, based on consumer shopping data. More consumers feel comfortable shopping on mobile than ever before. Security issues have diminished as the age of m-commerce has increased. Additionally, consumers are more and more of the “digital native” age, meaning they’ve grown up with computers and the internet their entire lives. These generations are more likely to use mobile commerce than older generations. One-page checkouts and digital wallets (Amazon Pay, Apple Pay, PayPal One Touch) have improved mobile conversion by up to 10% at launch. And it’s no surprise – as more consumers are comfortable shopping on mobile, more convenient mobile checkout experiences have surged in popularity. Still requiring folks to type in all their credit card numbers? You’re losing out on sales. 3. Easier to use sites. More and more sites are now optimized for mobile use. As mentioned earlier in this piece, m-commerce isn’t going anywhere. It isn’t the next new trend. It is a staple of modern retail. As a result, ecommerce platforms and businesses alike have moved into near 100% responsive site builds, meaning most sites today are easy to use on mobile. What’s more though is that many brands are moving to mobile-first, or mobile-unique experience. In this instances, a mobile site is created specifically for the mobile user –– different than what the desktop version looks like. Brands that do this often see an increase in mobile conversion due to easier site navigation and specific experience built for the unique browsing patterns and challenges of mobile shopping. Look, you don’t need an article to tell you that mobile commerce is important. You probably shop on your phone – or browse there at the very least. That said, numbers never hurt, especially if you are needing to convince others in your organization about the benefits of a mobile-first m-commerce strategy. So, let’s look at the numbers. Revenue impact for the retail industry. Mobile conversion increased 30% YoY from 2015 to 2016. Same store mobile commerce growth stats by country YoY. U.S. businesses – 24% growth. Australia & New Zealand businesses – 33% growth. iOS users spend 18% more on average than Android users. Desktop average order value (AOV) is 53% higher than mobile AOV (iOS + Android). Desktop AOV is 50+% higher than mobile AOV. Nabeena Mali is the head of marketing at AppInstitute, a DIY app builder for small businesses and passionate about sharing her knowledge and insights on design strategy, UI/UX trends and driving digital growth through content marketing. BigCommerce helps businesses drive more mobile ecommerce sales.